For a gardener like myself, it’s sad to say goodbye to my tired Winter garden, but on the other hand, I’m eager to get my Spring garden designed and planted immediately. 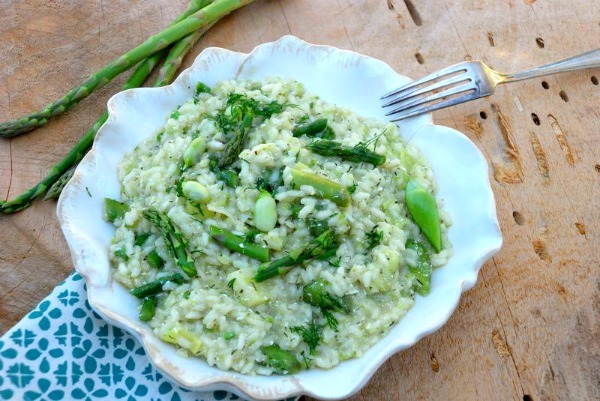 This Spring Garden Vegetable Risotto can be changed up with any seasonal vegetable you find at the farmer’s market or from your own garden. 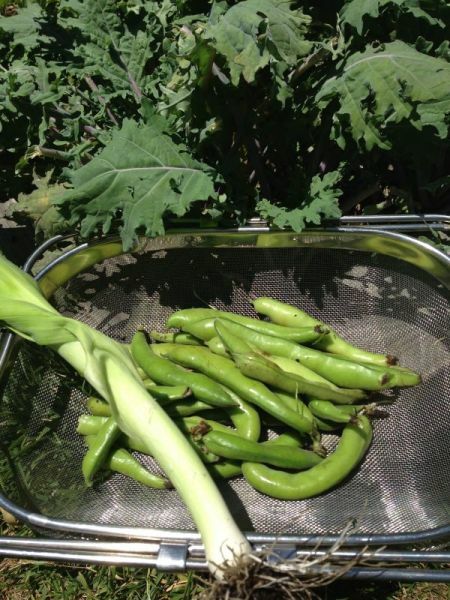 My fava beans and sugar snaps are still going strong, so I included them in this dish. After shopping at the farmer’s market the early asparagus and leeks have arrived adding them to the dish too. You can switch out any of the vegetables in this dish but remember to cut them small so they slightly cook in the risotto. I added Myzithra cheese to mine for a Greek Twist but you can add the traditional grated Parmesan cheese. A fresh Spring risotto with a variety of garden vegetables and grated cheese! Prep all the ingredients before you begin. Place the stock in a small saucepan and bring to a simmer. In a 4 quart dutch oven or heavy large pot heat to medium and add olive oil. Add the shallots and leeks for a minute or two until softened. Add the rice and dill and continue stirring for 2-3 minutes until rice is coated. Add the wine and stir until all the wine has evaporated. Begin adding the broth one cup at a time, making sure all the broth has been incorporated before adding another. Before the last cup is added, add all the vegetables, salt and pepper. Continue with the last cup. Stirring constantly. Add the butter and turn off the heat. Taste and adjust before serving. Oh that has the look of spring! Simply gorgeous.